For a reasonably small area of London, the borough of Kensington and Chelsea is blessed by two very fine parks – Holland Park in to the west and Kensington Gardens to the east. There are also a number of other open spaces to enjoy some tranquility in – entry to most is, of course, FREE! A wonderful, slightly mystical place, this Victorian cemetery is great for a peaceful walk or a bit of quiet reflection time. There’s plenty to look at too, and not just the gravestones – many fine buildings and monuments are located within the cemetery. Founded in 1673, today’s incarnation of the Chelsea Psychic Garden has an expansive plant collection (with particular emphasis on medicinal plants and rare types) and is also home to various species of wildlife. The Garden also hosts a lecture series and family activity days during summer. THere’s something about Holland Park that has a bit of a wilderness feel – go for a walk (or jog!) through the middle of the park and you’ll be taken by it’s tranquil, forest-like feel. There’s in fact plenty to do within the park – it’s home to a large sports field where you’ll often find people having a kickabout or a picnic (July 2010: the field is currently closed for maintenance! ); there’s also tennis courts, golf practice areas, a cafe, playgrounds for children; an open-air theatre (home to the Opera Holland Park each summer); and the beautiful Kyoto Gardens. Also a great way of walking between Kensington High Street and the area of Holland Park. One of London’s most famous and best parks, Kensington Gardens covers an area of 275 acres. This beautiful park is truly a gem for a relaxing amble through it – though easily just as suitable for a bit of exercise. Its vast size means you’ll always be able to find a quiet spot. Be sure to check out the Round Pond and its wildlife (ducks, coots, swans and more) and the lovely Sunken Garden by Kensington Palace, or the Italian Gardens near Lancaster Gate tube. The Orangery is also a top tip for a spot of afternoon tea. 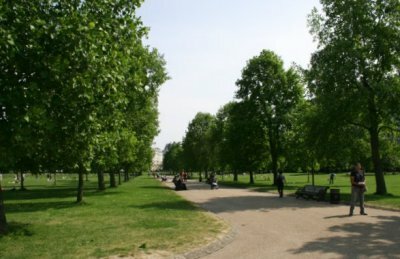 If you’re feeling very adventurous, don’t forget that Kensington Gardens becomes Hyde Park past the Serpentine, so there’s even more lovely greenery to enjoy. Situated right at the north part of the borough, Meanwhile Gardens has a pretty fascinating history. Started as a temporary community garden in 1976 (and the name “Meanwhile” comes from its supposed non-permanent status at the time), the gardens were and are intended to provide an open space area for local residents. (The gardens were transformed from an area of derelict land.) There’s play areas for children, a well-used skate park for the older generation, and plenty of greenery and even a pond with an abundance of wildlife.